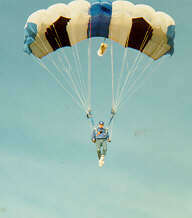 I started skydiving in May 1984 through the University of Minnesota Sport Parachute Club. 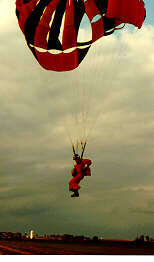 Because they offered the ground-school portion of the training on a weekday evening, I was able to complete my practical training early the next Saturday morning and quickly make my first static-line jump on a T-10 35' military round parachute. It was so much fun that I signed up for two more jumps that same day! I camped out to try to make more the next day, but due to rain had to wait for the next weekend to make two more static-lines and then my first free-fall. I was hooked. Later, I moved up to the maneuverable ParaCommander and Papillon round chutes. 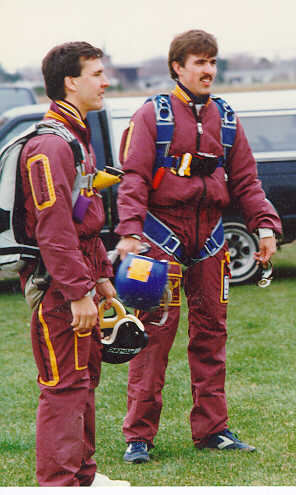 By Christmas break I had made about 90 jumps and went with the UofMN team to Tuscon, AZ to compete in the National Collegiate Parachuting Championships. 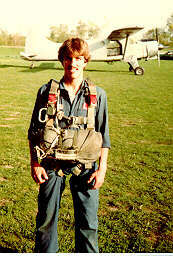 Skydiving was my life for about six years. I made over 700 jumps before my other interests started taking up too much time for me to remain at the level of proficiency I demanded of myself. During that time I had wonderful adventures and incredible friendships. There were a few moments of excitement too (even above and beyond the normal max-adrenalin), but these are best discussed over beer: "No sh*t, there I was ... thought I was gonna die ... 1000 feet with nothing but a silk worm and a pair of knitting needles ...".